3. Modern clips of Conway scenes today you can play immediately. 4. "Historic" clips of Conway you need to download to play (some must be purchased). 5. Videos waiting to be loaded. 6. A list of missing film/sound clips we'd like to find. Included this as an oddity, an audio book about the life of a cadet aboard the fictional anti-submarine frigate H.M.S. "Conway". Click here. 36-38 Interview with Lt Cdr Ian Fraser VC DSO RD RNR for a recent TV programme on the VC. Available via YouTube here. 49-51 Sandy Kingsford reminiscing and singing. Click here. You will need Microsoft Media Player installed to view these clips. 1928 Conway Cadets and Liverpool's marriage with the Sea cadets are seen 39 secs from start. 1940s clip of a day trip from Liverpool to Menai Bridge with a few shots of the ship. 1953 short clip of the ship aground - judging by her hull lines it was filmed soon after she grounded. Taken from BBC TV Flog It programme from Bangor and broadcast on 24/8/14. It also describes the Strait and the Suspension Bridge. A phenominal 3D rendering of the ship produced by the grandaughter of an OC. She has used the Vietnamese model as the basis of her modelling so there are a few discrepancies but they are immaterial compared to the final result. Click here. 2012 ITV local news coverage of the dedication of a blue plaque in memory of James Moody (04-06) and interview with Tom Mason (56-59) Club President. 4. Film clips or video that must be downloaded or purchased from a third party. - 1914-18 Pathe News film "Cunard River Trip" shows two brief clips of the ship. The film can be downloaded free of charge. You can view still images by clicking here and then clicking on the title "Cunard River Trip". Set 'view frame every' to 1 second, then image numbers 22 to 38 show the starboard side close up, and 56 to 62 from further away. Double click on any image to see excellent quality larger versions. Each frame can be purchased for £25! - 1931 November 11th Pathe News film "Prince of Wales as Master Mariner" shows the Prince visiting the ship. The 17 seconds clip costs £500 to buy. You can view still images by clicking here and then clicking on the title "Prince of Wales as Master Mariner". Set 'view frame every' to 1 second, then image number 43 to the end are of his visit to the ship. Double click on any image to see excellent quality larger versions. Each frame can be purchased for £25! - 1995 Quit Ye Like Men Be Strong a filmed history of Conway by Mark Williams. It can be ordered from the National Screen & Sound Archive of Wales. - 1998 Cambrensis television film company of Cardiff produced a SC4 film on the loss of the Conway. On Saturday 18th October 1998 filming took place on the Swellies. The film is in Welsh and, from time to time, is rebroadcast on other channels. There is no English version and no plans to sell copies. The BBC made several filming/ recording visits to Conway in the 1950s. The BBC archive is not yet online so if anyone knows the whereabouts of any of the following recordings please let us know by clicking here. 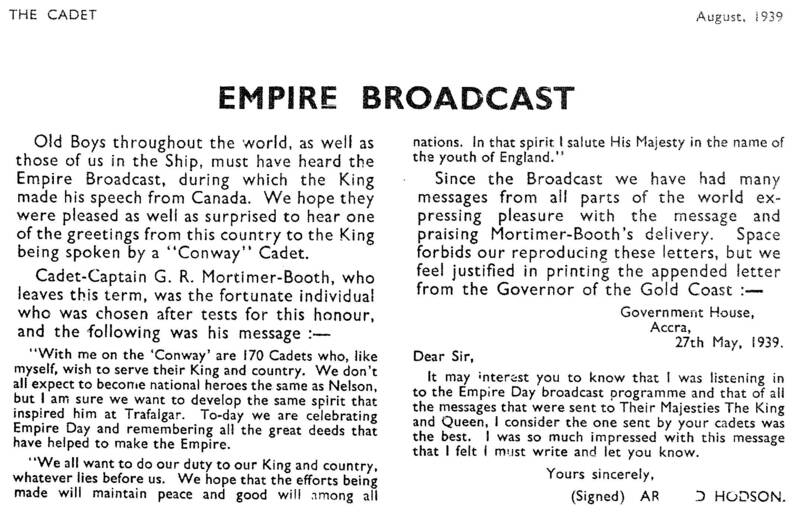 1939 Empire Day Broadcast: The King's broadcast was made from Canada and was follwed by loyal greetings from around the world. Cadet Captain G R Mortimer-Booth sent greetings from the UK. The text was published in The Cadet - click here. 1952 Autumn: a BBC television team filmed scenes on board as part of a programme about N Wales. 1954: Captain Hewitt seemed adept at gaining publicity for Conway, it was an excellent way to attract new boys. In March, the BBC visited and filmed the Conway song and a march past and this was broadcast on 13th April. 1956 Summer: The BBC filmed the Queen Mother's visit to Plas Newydd. 1956 June: Pug Bayliss made a speech on the radio. 1957: Following the success of their previous visit the BBC agreed to return for a full 10 days of filming providing they could erect 20 large floodlights around the Camp. It's not clear if this actually happened. 1952 Autumn: a BBC television team filmed scenes on board as part of a programme about N Wales.1961 August 2nd. 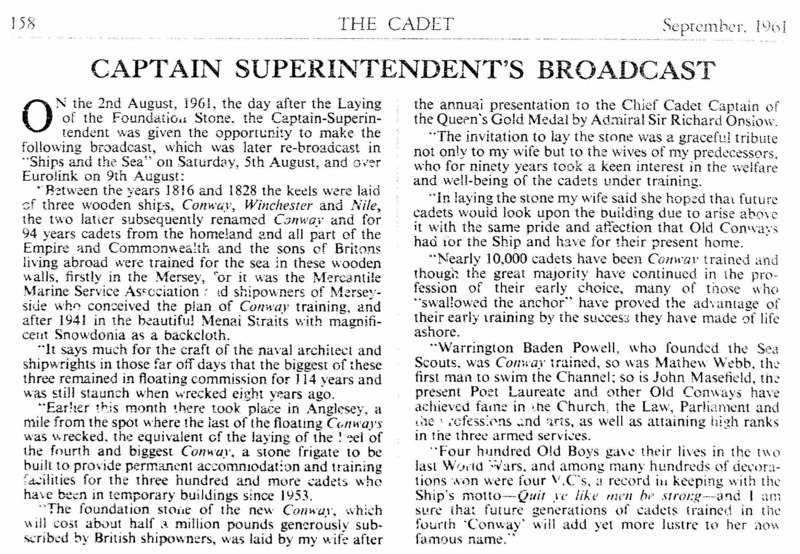 After laying the foundation Stone for the New Block Captain Hewitt recorded a broadcast that was transmitted on Saturday 5th August in the "shiops & The Sea' series. It was reboradcast on 9th August over Eurolink. The text was published in The Cadet - click here. 1974:"The BBC came to film the school before it closed and I remember we all went sailing and rowing in a force 5-6. All capsized and I think the RAF Valley rescue helicopter was called. Not the best advertisement for a naval establishment!" Sian Pari Huws's S4C series Hanes Cymru a'r Môr pisode 2 covered Conway but it cannot be found online. 7. Another sad loss HMS Worcester click here. interesting how similar the two vessels were. Worcester's loss was simple neglect by the RN who took her over during the war.